Excellent! I gotta try this! The forming in glasses reminds me of an asian dough done similarly using plastic wrap over something like muffin trays, ufo shaped indentations and the dough was mounded in the middle. Great Blog! Love the looks of the starter. The smell must be wonderful! Nov 18 // ...to make a starter. It smells much like corn. For obvious reasons, I didn't rinse it first but put it directly into a blender to turn it to flour. Then I mixed 60g with 60g water and it sat 57 hours (instead of 48) before I added 60g more amaranth flour and water. I'm not waiting the entire 24 hours before the next feed because I was a little late today. I'm hoping it will make the amaranth tastier, milder maybe. Mini, I made my starter with white rice flour (actually it's quite coarse, not as fine as starch or regular flour), adding a tbsp of yogurth and 2 drops of vinegar the first time. Refreshing every 12 hours it became very lively and sanely sour just after 3 days. Both your experiment, Mini, and yours, Nicodvb, are intriguing. I've got a 'fridge full of amaranth flour but haven't gotten around to making a leaven with it. And I want to - no excuse. So in a way you're doing my research for me... :) BTW I make shortbread cookies with amaranth flour. They're good with banana frosting (very South American!). Nico, I've eschewed rice flour b/c I was interested in going into grains that others haven't, but I'm curious to see how yours works out. What'd even be better would be if all us GF sourdough people could have a tasting party somewhere. Hmmm. Hey, your starter looks great! I'm cataloging the progress of my two new starters off-site, on my own blog, but I'm very impressed with yours. I've heard folks say they hate the taste of amaranth but it never fails to remind me of Peru, where I did a series of photographs in the 90's. So I'm going to have to follow your success and make amaranth starter myself. Keep us posted! Krampus is in a few weeks, Dec 5th. Amaranth taste... hate is a hard word. But there could be a few improvements. Lets say I haven't aquired a taste for it yet and looking for a way to enjoy it. The amaranth starter aroma is very slowly making headway or I'm getting used to sniffing it. I've not yet aquired xanthum gum and millet flour. I would be interested in mixing the amaranth starter in a palatable mixture of GF flours. Any suggestions? Herbs? How is it served in Peru? I had read that amaranth was often combined with banana and chocolate, also seems to be used more in cakes and sweet recipes... I use a fine metal coffee filter for washing the grain. Okay, it's evening now and I'm looking into my starter and the smell is....getting sour and the amaranth is taking on a milder smell. This looks promising! This is good! Ooo can't wait for the bread! Now I'm working on the starter. I am rinsing 60g amaranth and will dry it before milling and adding. This time I feed it 60g amaranth flour only (no water) and after 3 hours tuck away into the fridge. Hi, I bought some GF flour (Schar brand) that I'll test in the next few days with my rice sourdough. As for amaranth, are you sure it can raise a leaven? After all it's not even a cereal. your bread looks very lovely! Hello Mini. It sounds like your amaranth experiment is going well. This AM I walked through my neighborhood, which is quite Hispanic, smelling the smells and thinking of your question. Potato starch flour comes to mind, as does banana flour, yuca (tapioca)flour and corn masa (used for making corn tortillas in Mexico). Maybe coconut flour too. Then I read that porcini (Steinpilz) work w/ amaranth. But my neighborhood smelled mostly of boiling chicken, so I wondered, what about amaranth, potato starch and ground dried porcini (or black trumpet mushroom) made into dumplings and cooked atop chicken stew? I think another solution might be to keep the total amaranth down to about 20% and use a GF blend of Sorghum, millet, fine ground brown rice flour, corn starch, potato starch and tapioca starch, plus salt and xanthan gum. 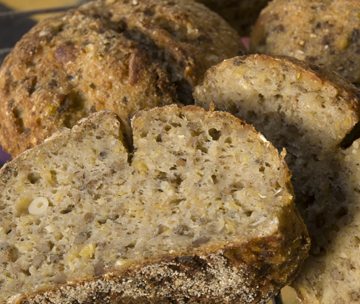 Finely ground brown rice flour plays an important roll in retaining moisture in GF breads. If you can't find it, try running regular brown rice flour through a food processor 1 to 2 minutes. I'm dying to see how your product comes out! I thought it best to put some of my experiments in a separate spot. Don't worry! I will post the gluten free bread here. I like what is happening to the amaranth grain. Thanks for the input, I'm not about to slice mushrooms into my bread but there are some dumpling ideas in my head already. GF ones! Have you tried the millet buns with mushroom cream sauce? I can see little bits of snipped parsley dancing through the dough. December 5 - Krampustag in Austria - I'm having a mushroom party to celebrate the foraging year just ended and party with friends. One of the breads I'll be making will be stuffed with Fontina cheese that's been tossed with truffle oil. I love mushrooms in bread, but maybe that's just me. 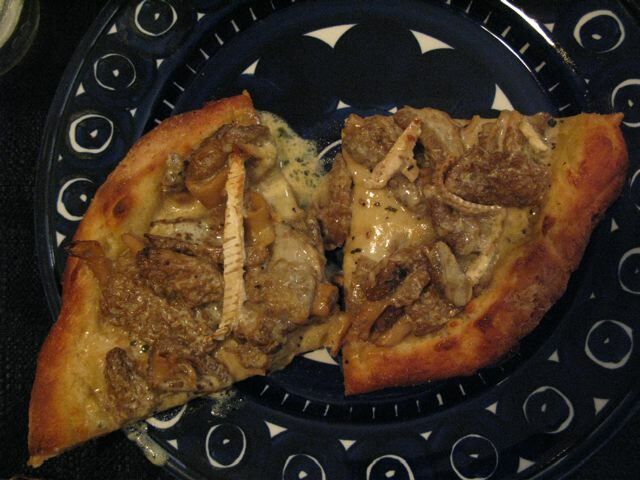 A favorite this May was pizza covered with morels in cream sauce. Best cheese for this was San André. No calories whatsoever! (Not a great photo but that's OK too). I've tasted better, but at least the crust is crispy and the interior, moist. Charles Luce's Recent Blog Entries.